HARU Stuck-on Design is a Red Dot Design Award-winning product from Japan, using washi and PET tapes. Creating a space type somewhere between gallery, showroom and office, we created a deliberate blurring between desk and canvas. We unified the space into a series of connected white horizontal and vertical planes, with the office functions inserted into a cloud-shaped negative cut out, with the cloud floating above. The curved desk profile contrasts with the straight lines of the tape to create a folded three-dimensional canvas. We maximised the canvas area, seeming bigger than the room and allowing colour and pattern to define the architecture rather than the office activities. The desk surface, on a forest of powder coated scaffold legs, aligns with the glazing transom, liberating the floor for tape designs visible through the façade. Haru means both ‘Spring’ and ‘to stick or paste’ in Japanese. The first tape design produced for the space by SoHo+Co features a springtime theme with an abstracted ‘sakura’ cherry blossom stretching out over water. 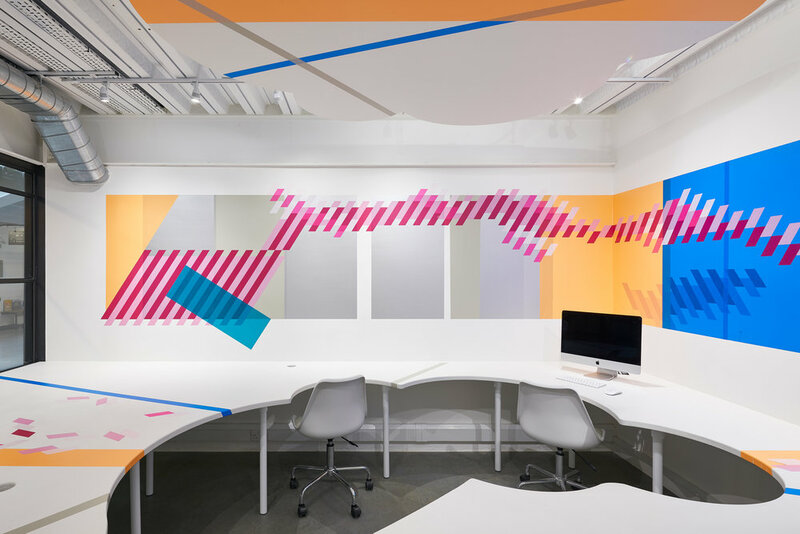 The washi tapes are combined in a variety of sizes and layers to demonstrate the different effects and how tape can be applied and removed across the desks, ceilings and wrap up the walls as one continuous canvas.